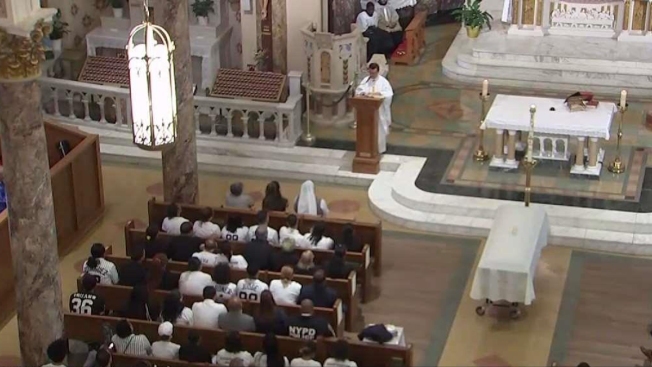 Tears and overwhelming heartache filled a New York City church Wednesday as thousands gathered to mourn the 15-year-old boy killed in a machete attack outside a busy bodega last week, a slaying that has drawn national attention for its caught-on-camera brutality. A somber police-escorted procession headed by a silver car ensconced in flowers led the brown-topped hearse carrying the body of Lesandro Guzman-Feliz down the streets from the funeral home to Our Lady of Mount Carmel church, where family and friends remembered the beloved teen who dreamed of being a cop. Bystanders paused on the street to pay their respects; more crowds lined either sidewalk as the hearse arrived at the church. And a chill fell over the service as mourners, many of them wearing Yankee jerseys in remembrance of Guzman-Feliz's longtime fandom, carried a casket draped in white to the altar. Later, the pallbearers carried the casket back outside -- and a relative started weeping a new when he saw the crowd. They began chanting in unison "Justice for Junior" over and over as his body was placed in the hearse en route to the cemetery where he will be buried. The horrifying attack on Guzman-Feliz was captured on video; he was dragged outside the bodega and set upon by a gang of men who hacked at him as he struggled to defend himself. The boy was slashed in the neck and died after running to a hospital three blocks away. The teen's funeral came on the same day the NYPD's chief of detectives said the machete attack on him appeared to be linked to a shirtless mob attack on a 14-year-old boy in the middle of a Bronx highway three days earlier. And it came a day after authorities announced an eighth arrest in the case, which family members say was a matter of mistaken identity. Authorities said Tuesday that the eighth person arrested, 23-year-old Elvin Garcia, a Bronx resident, was charged with murder and manslaughter, among other crimes, in connection with the killing. Six other suspects were arrested in New Jersey and have agreed to be extradited to New York City to face charges in the case, though the specific nature of those charges wasn't immediately clear. These suspects, men between the ages of 18 and 24 from the Bronx, Long Island, and Paterson, New Jersey, appeared in a New Jersey courtroom Tuesday. One of the suspects hung his head the entire time, unwilling to look up as the judge spoke to him. The others listened quietly through their hearings, stonefaced apart from at least one apparent sneer, responding "sí" or "yes" to questions. All will face charges of murder and other crimes.